Back in September I came up with an idea for a Christmas game that involved driving Santa’s sleigh and reindeer through the snowy Christmas Eve skies. At the time it seemed too early to be thinking about Christmas already, but games do require time to assemble. It is now November 28 and in my opinion, rather late to be launching. Free games like mine only thrive if they can virally spread themselves across the internet to the many thousands of game portals. This takes time, and likely won’t happen by December 25. I guess there’s always next year. This idea originated from my desire to do something with “inverse kinematics”, the motion of connected objects and how they affect one another, something I learned from a super book by Keith Peters called, “Actionscript 3.0 Animation: Making Things Move”. I initially wanted to try this with a train game, which I still hope to do. The connection of the reindeer to each other and ultimately Santa’s sleigh offered a perfect opportunity to apply these phyics to something real. Well, sort of real. I am always surprised at the amount of code that goes into these projects, and the number of bugs I wind up having to hunt down and fix. What originally looked like a simple weekend project became literally thousands of lines of code. Add in the quest for decent music and graphics, and you wind up with a two-month ordeal. I don’t really know how to rate this game. It likely resides somewhere between “kinda fun” and “pretty damn stupid”. I hope that you like it. Your job is to be Santa, riding his sleigh through the snowy skies of Christmas Eve. Control is very, very basic. The up key takes you up, and the down key takes you down. The control point being the lead reindeer, with the rest of the pack obediently following in chain. 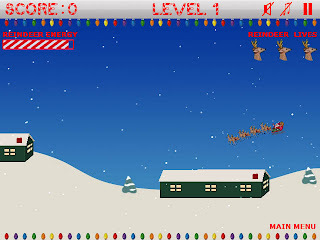 You must land on as many roofs as you can, while ensuring that the reindeer get plenty of food. In my world, reindeer eat candy canes. It seemed to me like the most appropriate reindeer food for a Christmas game. After all, how much fun would a Christmas game be if the reindeer were stuck eating lichens and vascular plants? Candy canes rain down from the sky and you must gobble them up often enough to prevent reindeer starvation, which could cost you a life if you are not careful. Each successive level offers something new, such as terrain, obstacles, heavier snow, more rapid energy depletion, and smaller roofs. Like most of my games, this one has ties to aviation. It was originally to be somewhat like a flight simulator, requiring speed control and a smooth round-out to touchdown. Unfortunately my crack beta team hated it, and so I removed the realistic properties of flight and made it a simple “point it at the roof and land”. I sincerely hope you approve of this game, and as usual, feedback is always greatly appreciated. This entry was posted in other games on November 29, 2009 by admin.